Apologies for being on radio silence. We have had a couple of action packed days out in the back of beyond, without access to wifi. I am now back in the wonderful Yoshimatsu ryokan, the aforementioned English country pub but with judo mats. Wow. Not an English pub at all, but a serious upmarket spa. Indeed, these sort of places probably hold the copyright for the sort of posh establishments you see dotted around in the West – all soft music, dressing gowns and water features. We have our own hot bath on a private balcony, shielded and fanned by acers. I am sitting here writing this to you sitting in a kimono next to the central pond, cooled by a gentle breeze off Lake Ashi. I was thinking James Bond in Dr No. Karen says lobster in fancy dress. The Mountain is a little like Newcastle United, in that it has its very own religion. It is almost 13,000ft high and sits on its own, usually topped by a cone of snow (everybody knows the traditional Japanese pictures). Our plan was to climb for four hours, stay in a hut until the wee small hours and then strike for the summit for dawn. There were an amazing amount of people setting out to do the climb, and the average age seemed to be 103. There must be something in this dumplingly stuff. Most were kitted out very well, although some (the youngsters, or Americans) were staggeringly under prepared, lulled into a false sense of security by the existence of a path. They have those at the mall, right? We had the services of Shoji, a local guide who was able to tell us about the Mountain customs and the done thing at the huts. This was another occasion when loads of other people purloined him. Sigh. We arrived at Hut number One at the Eighth Station for tea and a spot of shuteye before the final push. The absence of chairs whilst eating induced more filial amusement. It was then that the Mountain showed its true colours: having been basically benign all the way up, it now started to howl a gale and chuck it down. The wonderful Shoji (hire him, he’s superb – FYG Mountain Guides) frantically scanned the weather data (ace connectivity up there…) and continually adjusted plans throughout the night, leaving us to sleep on oblivious. He eventually woke us at 3am, telling us that the summit was going to be shrouded, and we could get the sunrise lower down. There were 20 other tours going up the Mountain that night, and all but one (us) sacked it. So, we donned our storm gear, turned on our head torches and headed into freezing rain, fog and extraordinarily powerful gusts of wind. Fuji gets steeper as it gets higher, and the broad motorways of lower down turn into pretty tricky slithery scrambles up volcanic rock buffeted by some scary gusts, all in thinning air. 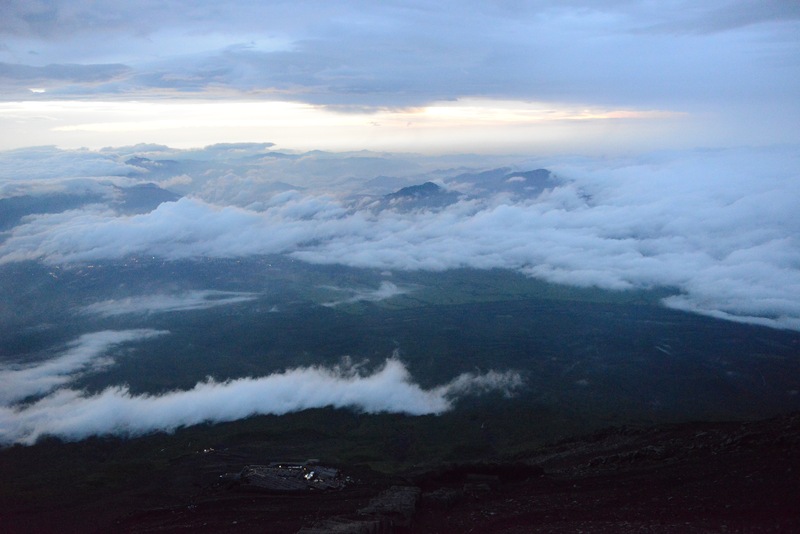 We came on sunrise just before the cloud (awesome Shoji) and the views were spectacular (see the picture). We also came across some people in the mist that were pretty done in – there’s no easy way down from there. We made it to a misty summit (2km all the way around the (still active) crater), and then started our descent, using a different path which was wider and covered in a sort of volcanic scree. Karen decides to run down the mountain, followed by a breathless guide (and even more breathless husband). The looks on the OAP tours still making their way down the Mountain having aborted their attempt at the summit as we passed were priceless. Back in our ryokan, we now move to Kyoto and surrounding areas tomorrow. Keep tuned.